Henri Breuil (1877-1961) has been called the father of prehistory. Little known in the UK, he should really take a place alongside Freud, Darwin and Marx as one of the scientists who sent shockwaves through 20th century thought; he changed the way we see our place in the world for good. Breuil was a cleric, a scientist, and an artist. His copies of prehistoric parietal art gave the public its first glimpse of subterranean masterpieces aged between 20,000 and 40,000 years, He is reputed to have spent 800 days underground, at sites like Lascaux and Altamira. And he squared the facts of prehistoric life with his Catholic faith, just as he put his gifts as an artist or copyist at the service of his scientific mind. Some work was done on the back of a proverbial fag packet. Having spent this week at the archive of the Muséum nationale d’Histoire naturelle, I come away with an uneasy sense that the first draft of prehistory was written on miscellaneous scraps of paper. Breuil threw away nothing and wrote, and drew, on whatever came to hand. But whereas his subjects reached for bone, antler, and rock face, Breuil was happy with recycled calendar pages and wine lists. From time to time, at least. 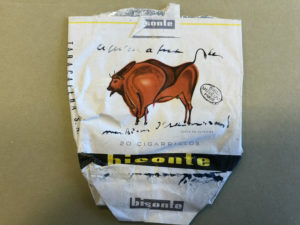 Breuil even writes on a literal fag packet (see picture): “Ce qu’on a fait de mon bison d’Altamira!”. In some other words, Zut alors! Look what they’ve done to my Altamira bison! This iconic image, from the Sistine Chapel of prehistoric art in Northern Spain, echoes one of Breuil’s own copies. In his lifetime he published some 600 drawings, watercolours, pastels or oils. Plenty of material to inspire a graphic designer. It can be clearly seen that the newfound facts about man’s long history were marketable enough to sell a product with the clear potential to shorten your future. Breuil was, by all accounts, a chain smoker. But it is hard to know what he felt about this instance of cultural theft. At least, the cigarette packet, as seen in box BR-7, demonstrates that knowledge percolates out of the academy by unexpected means. And that cave painting, a matter of national pride in Spain upon the discovery of Altamira, is no less likely a marketing hook than the 14m high roadside bull silhouettes which have, since 1957, advertised Sherry in Spain. But this love of the bovine goes way back. If this has reminded you of any other marketable reproductions of cave art, please send them through to me at mark [at] criticsimsim [dot] com. While some consider we are now post-postmodern, it cannot be denied that we still live with many features of the condition identified by Jean-François Lyotard. My theory might be rusty, but it seems the internet has only heightened matters, and the age of simulacra is still very much with us. There’s no getting away from it, but if you still want to get beyond hyperrealities, you might well find yourself drawn to the art of the past. And if you develop a taste for this you might want to get right back to paleolithic art. What could be more authentic than the cave painting of a cave man? But rather than get back to life as it was perceived in the Pyrenees, say, 40,000 years ago, this piece will argue that we are locked out from raw and therefore real contact with cave art; though perhaps we always were. And we’ll see that, taking Altamira in Spain as our example, simulacra and fakery are of a holistic piece with the history of the caves both recent and in the deep past. There was nothing authentic about the world’s first recorded artists and this structure has found echoes in the reception of their work today. In his fascinating book, The Mind in the Cave, David Lewis-Williams lays out a number of theories about prehistoric art. And what comes across strongly is that whatever thoughts went through the modern brains of the artists, the original audiences at Lascaux, Chauvet, and indeed Altamira, must have experienced cave art in a way so different from gallery art today, we might not recognise it. Cave walls represented a gesamtskunstwerk and the pictures themselves were to be seen with flickering torchlight and possibly with music and dance. Art was a bona fide trip, but as we know from our own religion (modern science) altered states no longer offer privileged access to information about the world. So cave art and make believe evolved hand in hand. During the tens of millennia of its first hand reception it required a suspension of disbelief from both the artist and the rest of his or her clan. Now, it could be argued, there’s no faith without doubt, a fact just as true for even the most fundamental of our 21st century believers. Perhaps it is even doubt which provokes fundamentalism, but that is a digression. Lewis-Williams makes clear that the art of the caves of Western Europe was the result of vision questing. In short it was, via drugs, sensory deprivation or lack of oxygen, the result of self-induced hallucination. The shamen knew what they were doing and their status depended on it. Quite why and how cave art came to be characterised, across Europe, by many hundreds of recurring motifs, by the same species, by entopic marks, by hand prints, is a discussion for another time. It’s not a question that even Lewis-Williams clears up to the reader’s satsifaction. And the most likely theory, hunting magic, cannot account for the lack of Reindeer on the walls, especially at Lascaux where that prey’s bones are to be found in plentiful numbers. The most intriguing idea, to me, is that different species represent different clans and as a result cave art is not a confused rush of bovine and equine imagery but an epic art form, a history painting. But surely that’s just another expression of the longing for an authentic, and in this case materialistic explanation. There never was, and never will be, an art of pure and partisan representation. That’s for the realm of propaganda and no one who has been touched by cave art could possibly allow for the possibility that the caves were some form of lecture. Just ask the archaeologist who spent some 20 minutes in tears when he first saw Lascaux. And just consider Picasso, who said of that cave: “We have learned nothing in 12,000 years”. We have, however, learned plenty. We have learned how to tease the cave experience out of the ground and into a wealth of picture books, cinema, postcards and posters. We have dematerialised the cave and allowed it to float through our daily lives in the form of jpeg galleries, mobile news stories and tourism sites. We have learned how to market the cave experience to a 21st century audience and how to generate revenue undreamt of by the men or women whose handiwork we have come to celebrate in this way. The caves have become portable, which is somewhat counter-intuitive when you consider them as the ultimate parietal art form. (It makes as little sense as that piece of street art soaked off the side of a pub wall and sold to a millionaire.) 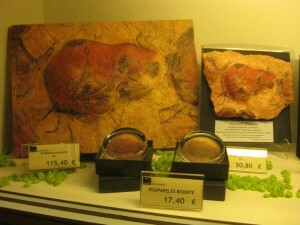 In Altamira, for example, you can even buy a chunk of the cave to take home and fix on your living room wall. Okay, it’s not actual rock taken from the original site. It is instead ceramic. And one of the bison has been scaled down and reproduced on a souvenir retailing for close to €100; somebody should notify the artist’s estate. A wall mounting like this has various advantages over a poster. Not only does it carry more literal and hence metaphorical weight, it is also in low relief which, as you may well know, is a key factor in the art of paleolithic man. Cave walls were not a blank canvas. Instead, they gave the artist a topology of dips and bumps, and the creative interpretation of these was the very beginnings of representation. The ceramic bison demonstrates how a ridge of rock can suggest the backbone of a 1000kg bison. We can verify this with a trip to Altamira itself. The lasting impression of this author was of an array of these bulls suspended low overhead and undulating like orange clouds. But there was nothing in the least bit authentic about this close contact with artistic origins. Two years ago, at the time I visited, the original cave at Altamira was closed. Tourists like myself were shepherded instead through Cueva II, a large partial replica to what we might otherwise have found underground. There are pros and cons for building replica caves, as indeed they have also done at Lascaux and Chauvet. Their chief function is to preserve the invaluable art found in the darkened chambers of a genuine cave. One supposes that replica caves are also more accessible, better lit, easier to provide interpretation. The cons are pretty self-evident too. You won’t get much atmosphere from a fibreglass ceiling. You won’t get the play of light and shade or the echo of subterranean water dripping, as Lewis Wiliams points out. And you won’t get that clammy cold feeling which can surely facilitate goosebumps and hair standing on the nape of your neck. So overall, replica caves are a necessary evil. But they structure the experience of primal art as a theme park visit rather than the real thing. If they do their job properly they are quintessential fakes. And the €100 tile which you pick up in the gift shop is therefore a fake of a fake. Hence we are totally cut adrift from just that strain of art which might have brought us closest to the essential role of art on this planet. The gift shop at Altamira says as much in its way as all the scholarly literature combined. It is the noisy rebuke to first hand research and understanding. But these layers of fakery go back in time themselves. At the time of its discovery, 1879, the whole of Altamira was considered a forgery. It was only the word of amateur archaeologist Marcelino Sanz de Sautuola, against those of two French experts, Gabriel de Mortillet and Emile Cartailhac. The experts alleged that a contemporary artist was responsible. It seems that even face to face with the authentic and the real, we cannot always see it for what it is. So we vacillate between the moving, direct experience of those with access to the real caves and the gawping enjoyment of a tour round one of their replicas. We are moved because we expect to be and we love the replicas* because we love all make believe. In that sense we are not a million miles from the twin mindsets of the shamen and his public. And despite the lack of drumming and smoking lamps, this two speed model of reception might even hold true for the art with which we surround ourselves today. The simulacra and the simulacra makers have been around forever and show no sign of going away. *Unless we are Jonathan Jones, who by a wild coincidence has written about cave art today as well.